A primer on how to choose and use the optimal portable electrical generator. Sometimes electricity is unavailable in the back corner of a working boatyard. Or, the extension cord run is so ridiculously long that voltage drop causes power tools to operate erratically. For these situations a portable electrical generator provides a common sense solution. Weighing about as much as a small outboard motor, they are light enough to carry from the trunk of the car to the boat. 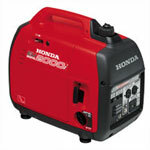 More salient, portable electrical generators generate enough current to power sanders, drills and saws. During autumn lay-up, when the sun goes down early, generators can illuminate a work area long after dark. 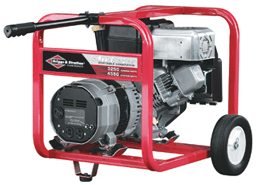 Here then is a primer on how to choose and use the optimal portable generator. Begin by determining how much electrical output is required. To do that, read the specifications plate riveted to the power tool. It states model number and current draw. For example, a 3/8 inch drill might need 3 amps, a D/A sander 4 amps, and a circular saw as much as 5 or 6 amps. Whatever the current draw is for the biggest tool, add about 30 percent. That is for the simple reason electrical motors need more power to spool upthan to keep running. Sometimes the spec plates reveal both current draw and starting power. Either way compare the tools rating to the output of the generators you interested in. Know that portables are rated in both watts and amps. To make things easy keep in mind that 7.1 amps is 850 watts, 8 amps is about 1000 watts and 16 amps is 2000 watts. A kilowatt (kW) is 1000 watts. For most do-it-yourselfers 700 or 1000 watts is sufficient. Though, larger power tools will need 2 kilowatts. Besides powering AC power tools, many portables features a 12 volt DC outlet good for charging starting and deep cycle batteries. Know that we condemn the notion of bringing a portable onboard a boat for tools or galley appliances because of very real dangers of electrocution, fire and carbon monoxide poisoning. So to be safe remove the batteries from the boat and recharge them on the hard. Also important to know, some generators allow drawing either AC or DC, but not both at the same time. Some boatyard portables are destined to provide emergency power at home after a natural catastrophe. There is a limitation worth noting. Lower priced portables are not intended for 24 hour operations. Neither the engines nor the windings on the generator can survive without rest. Hence a duty cycle of 60-percent. When finished with an electrical generator set, decommission it just like any other marine engine. That means dosing the gasoline with stabilizer and running the engine long to circulate the fuel throughout the entire fuel system. In the alternative, portables typically feature a special screw that allows draining fuel out of carburetor. Be sure to protect the valve faces, cylinder walls and piston rings against rust. It is easy. Remove the sparkplug(s). Shoot a big stream of fogging oil into cylinders and down the carburetor throat. Hand crank the engine through couple of revolutions to slather up the oil. Then replace the plugs finger tight. Finally, before the first time you ever start the electrical generator, be sure to sit down with the owner's manual. Read it thoroughly to insure your personal safety and its long, trouble free life. Noise levels are a major factor in determining the right model and brand of electrical generator. This is especially true in areas with noise ordinances. Fortunately, most generators are labeled with a decibel rating. 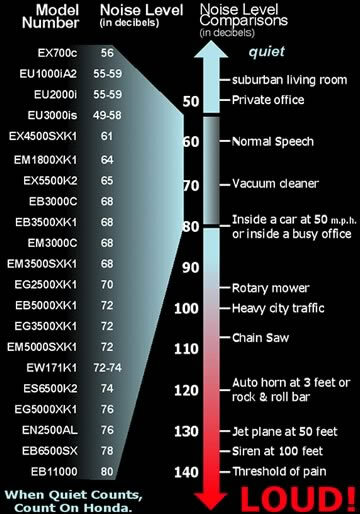 Consider that for every 10 decibel increase, the noise level is 10 times louder. For example, a generator that runs at 70 decibels is 10 times as loud as a generator running at 60 decibel. See the chart above to get an idea of how loud, is loud.